Enormous thanks to all the guys who run the 10k with the Pink Log - remarkable effort since some of you had such bad hangovers! Thank you Ben in organising such a great fund raising event and for all your continued support. I can see that the log run could become a yearly event over different terrain and courses! So watch this space for news of the Pink Log! If you wish to sponsor the boys please visit: www.justgiving.com/Ben-Richards52. 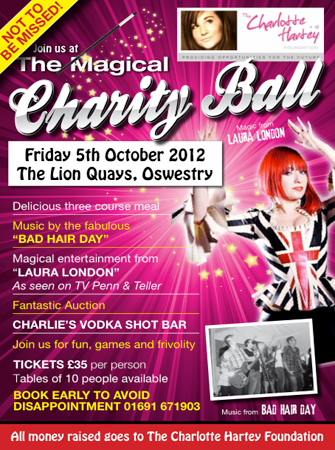 Any donations greatly received. 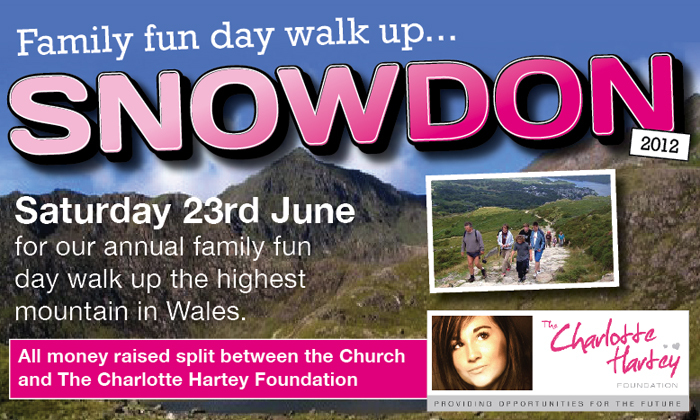 We are pleased to announce that the walk did take place on the Saturday 30th June, a week later than planned due to the awful weather. The day of the walk was not much better. Karl Hartey said "The morning started mild enough - but near the summit the clouds drew in and the heavens opened with gusts of winds up to 35-60 mph. It was hard going!" We would like to thank all those who managed the day and in particular young Raffy Jermy aged 10 for completing the walk. Click here for photographs from the evening. We would like to thank Moreton Hall School for there generous collection of £212.09. The sum has been collected over a over a 12 month period. Many thanks for your kind generosity. For the second year running the intrepid trio Karl hartey, Stuart Jermy and Paul Seager once again completed the 22 mile off road course through some the wildest yet nicest welsh countryside raising over money for the foundation. Paul Seager would like to thank all who sponsored him personally having raised £42.00. The Charlotte Hartey Foundation recently received a pleasant surprise in the shape of a very kind donation from local estate agents Morris Marshall & Poole. The company nominated the Foundation as their preferred charity. The cheque comemorates 150 years of business excellence. Karl Hartey said "We are so grateful for the generous cheque of £150 and look forward to passing on the money to the community. I am touched by the gesture and wish we wish them 150 more successful years of business. Matt Turner is raising money for The Robert Jones and Agnes Hunt Orthopaedic Hospital, Gobowen and also The Charlotte Hartey Foundation. 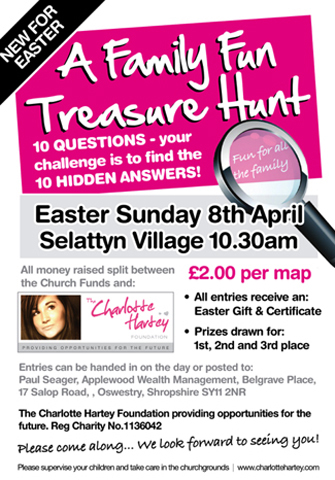 Matt is trying to raise £2000 as a standard donation to the hospital and raise as much as possible for the Charlotte Hartey Foundation! Charlotte was a very close friend of Matt. The Orthopaedic Hospital is a leading orthopaedic centre of excellence. A specialist hospital with a reputation for innovation, the Trust provides a comprehensive range of musculoskeletal (bone, joint and tissue) surgical, medical and rehabilitation services; locally, regionally and nationally. All knitted Chicks provided by Marina Stroud of Ludlow (07803 804470) with Cream Eggs provided by Elis John Morrow. 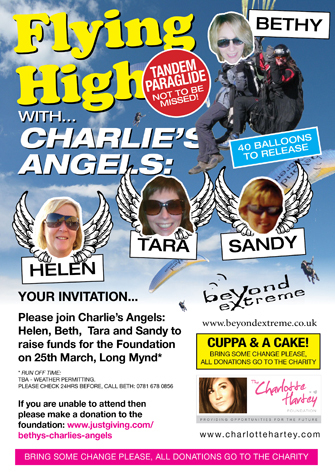 Well done to the brave paragliding Angels: Beth, Helen, Tara, Sandy, Stephanie, Trudy and Kay for raising a magnificent total of £167.18 by making the tamdem paraglide on 25th March 2012. And lastly, but by far, most importantly, thank you to Mark, Mick & Andrew from Beyond Extreme for keeping all the Angels safe.